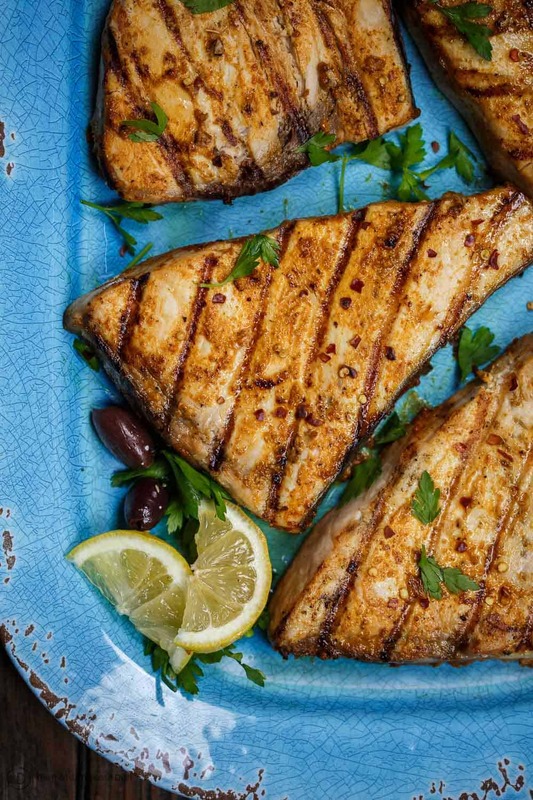 Knock this Mediterranean-style grilled swordfish recipe together in a few minutes! Quality spices, fresh garlic, and EVOO infuse it with tons of flavor. What a treat! As we follow the Mediterranean diet, my family eats fish fairly frequently–twice per week, most weeks. Admittedly, we do quite a bit of salmon, halibut, sole, or even canned tuna. But on days I run into a great swordfish sale, no question this swordfish recipe becomes dinner. 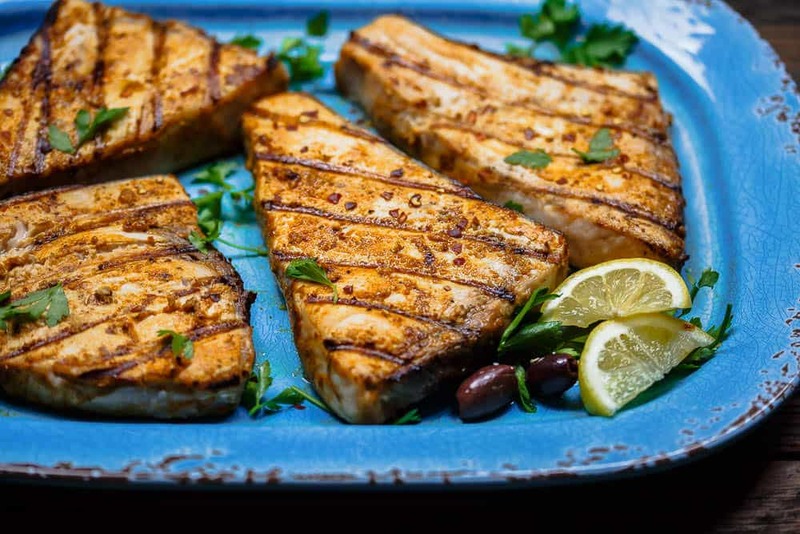 Aside from it’s many health benefits, swordfish is like the steak of the sea–satisfying, sturdy, and takes well to serious spices and marinades. This grilled swordfish recipe is quite simple. It starts with a thick cumin spice marinade–oh, with 12 garlic cloves and excellent EVOO, of course! The swordfish are basically covered in this quick marinade, then grilled to perfection. 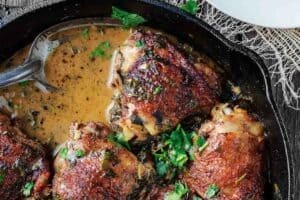 By the way, you can make this on any given weeknight, it doesn’t require a ton of marinating time. Just set the marinated fish aside while the grill is heating! But of course, if you’re not in a hurry, then cover and refrigerate for 1 to 3 hours. 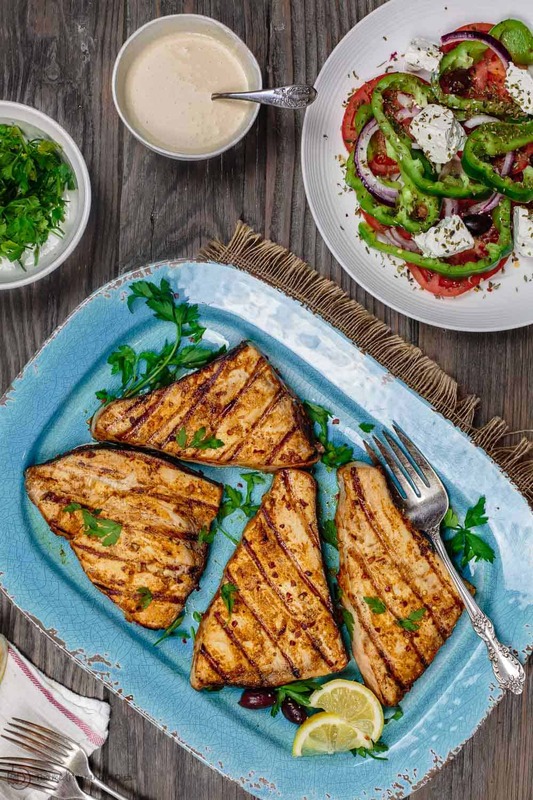 Tahini sauce goes perfectly on top of this grilled swordfish. I like to add a traditional Greek Salad and Lebanese rice. 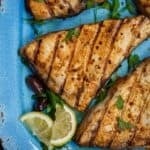 Easy grilled swordfish recipe that utilizes a great Mediterranean marinade with cumin, fresh garlic cloves and more. But you don’t even need to leave it in the marinade too long! Just a few minutes while your grill is heating! In a food processor, blend the garlic, lemon juice, olive oil, spices, salt and pepper for about three minutes or until well-combined forming a thick and smooth wet spice rub. Pat the swordfish steaks dry and apply the spice rub mixture generously on both sides. Now place the swordfish steaks in a dish and set aside for a few minutes while you heat up the grill. (If you have time, though, cover and refrigerate for 1 to 3 hours). Preheat a gas grill on high (be sure to have wiped the grates with an oiled paper towel). When ready, grill the fish steaks on high heat for 5 to 6 minutes on each side (a total of 10-12 minutes), turning over only once. Serve immediately. Add a pinch of crushed red pepper, if you want some heat! You may need to adjust the grilling time depending on the thickness of the swordfish steaks (10 minutes on the grill per 1″ of thickness is recommended). Grills do vary, I use this Weber grill. Recommended for this Recipe Our Private Reserve extra virgin olive oil; organic cumin; coriander; sweet Spanish paprika . SAVE! 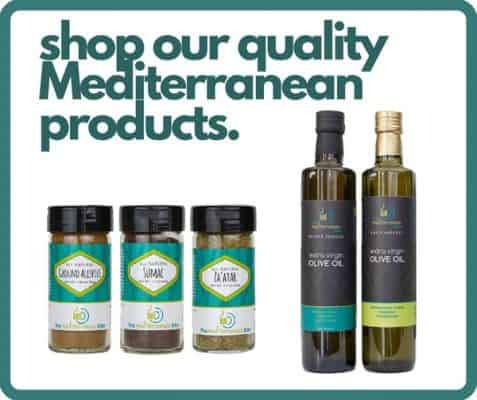 Try our Ultimate Mediterranean Spice Bundle; or create your own 3-pack or 6-pack of our all-natural and organic spices! 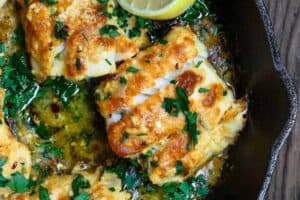 Excellent recipe, this was the best swordfish I’ve ever had. Next time I will try it with the tahini sauce. Awesome, Brad! So glad to hear it! 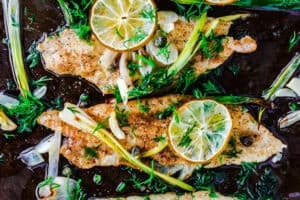 Any objection to letting the swordfish marinate in this recipe overnight? Wow, this was excellent! I had some tuna steaks and looked on your site first for a recipe. I had read that swordfish and tuna can be used interchangeably in most recipes, so took a chance on this. My whole family LOVED it, even though I overcooked the tuna a bit (I grilled it on my panini press and it went SO fast!). I will make this again with tuna and I’d love to try it with swordfish sometime too. Thank you! Wonderful! Yes, tuna and swordfish could be interchangeable depending on the recipe. Glad you tried this one! I thought it didn’t need to cook this long. Hi Sue, thanks for sharing! I do think cooking time will depend on the thickness of your fish and also perhaps the grill. 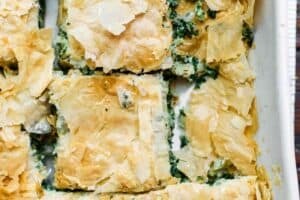 I just tried this recipe and it is delicious, especially with the Tahini sauce. A couple of points of interest though. 1) If you are making this for one, and paring down the recipe as I did, even the smallest food processor will not make a liquid paste as is called for. The blades sit too far off the bottom and you get sprayed up or non-emulsified liquid results. If making for one (or perhaps two with a large processor), you may want to scape/knock some of the large chunks off prior to grilling. Make the Tahini sauce! The Tahini was available in the rural north (in with the bottled olives, pickled asparagus, and grape leaves), you should be able to find it a larger stores. Again, it was delicious, Suzy. Thank you for the recipe, it will be used again. Used this rub tonight on swordfish and halibut and it was absolutely delicious! I didn’t have coriander so I subbed cilantro and it was perfect! Even my picky kiddos loved it. Grilled some pineapple along with it and it was a perfect compliment to the spice combination. Thanks for sharing! Now when kids approve, i know it was a winner! Thanks so much for sharing, Meg! This looks so good!!! I love grilled fish!!! It is! And so simple. Thanks Deanna! Swordfish is such a great “meaty” fish, and hold up so well on the grill. I love smoked paprika and use it all the time. 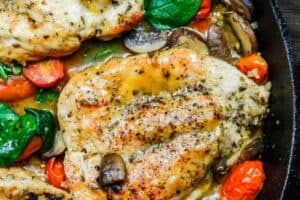 What a quick and delicious dinner for any night of the week. When I first saw the picture, I thought this was a Salmon!! But it’s a swordfish. I guess I got trick by the beautiful pictures you’ve taken. Thanks for sharing. Swordfish is great! Have you tried it? We especially like it grilled this way. Swordfish is my favorite fish…. Ive never grilled it before so I can’t wait to add this to the rotation! :). Great idea but needs to be marinated over night if fish is more than 1” thick.